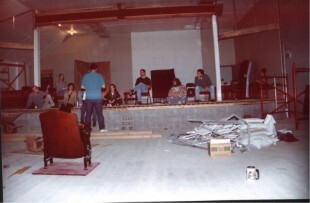 Below: Our 1997 Dracula 10 days prior to opening! And, no, that's not a Balderson theatre seat in foreground! As Dracula was the first production there, we opened the tenth anniversary season of the Studio with another rousing production of the original vampire play! It still grabs an audience! A warm and unusual comedy from Foster gave us a lot of pleasure for Christmas -- a modern Christmas tale full of imagination and fun, as well as some thought-provoking moments. In our opinion, one of Simon's best plays. There is humour, there is character, there are one-liners, but above all, there is humanity that is sometimes lacking in his work. A moving production that entertained as well. 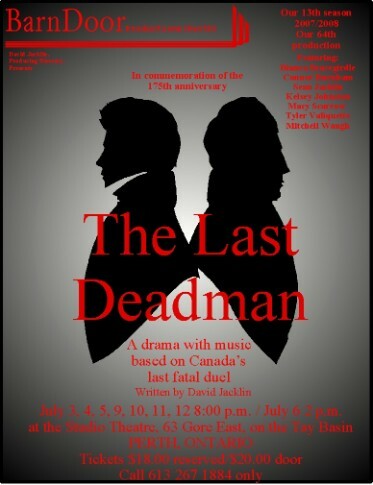 Twenty-five years after our first production in Perth, and the play's premiere production, we revived this drama about Canada's last fatal duel. An exciting, gripping production that featured a talented young cast, including our own son in the lead role! Based on, not one, but TWO plays from the Marks Brothers archive. Oh, You Kids! 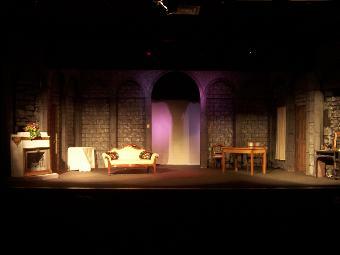 is a short, very funny farce; Two Days to Marry is a full length, not as funny show. The two share almost the same plot and set of characters! Combined, they are a laugh riot.